Even though Rockstar Games and Team Bondi’s L.A. Noire had its fair share of flaws, I couldn’t help but wonder how many developers would incorporate similar mechanics and concepts into future projects. Not every studio has access to high-tech facial capture equipment with the ability to pump out wonderfully realistic character emotions, but there was much more to this 2011 release than the MotionScan incorporation. Thankfully, both Square Enix and developer Airtight Games seem to recognize that fact. 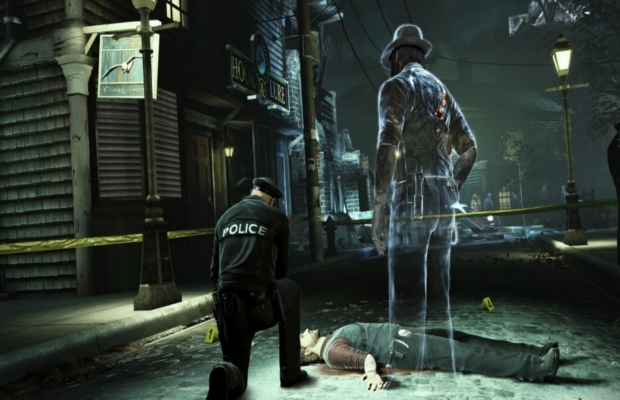 Airtight’s latest project, Murdered: Soul Suspect, is all about solving one, massive felony. Similar to Detective Cole Phelps from L.A. Noire, the protagonist in Soul Suspect must piece together clues by scouring the scene of the crime. Conversations with the police and witnesses, as well as scattered pieces of physical evidence that can be examined, help to fill in a few blanks that may lead to solid leads on the criminal. However, none of the items in the environment can actually be touched by detective Ronan O’Connor. Why? Because the mystery he’s trying to solve involves his own murder. Players take control of a translucent, ghostly form of O’Connor who saw his life cut short through a long fall and seven bullets to the chest. That’s not exactly the most pleasant way to go, so instead of moving on and resting in piece, the hard-nosed professional takes the case into his own transparent hands – with a bit of help from the living, of course. Although it may sound frustrating to explore a world without the ability to touch anything within it, Airtight has plenty of interesting mechanics in place that make the activities seem both intuitive and challenging. O’Connor has the power to jump into the body of those still residing in the world of the living, and this allows him to both understand what’s going through their eyes and use their physical bodies to accomplish crucial tasks (you know, like touching stuff). O’Connor can also walk through any wall within a building, making the investigation a much simpler process. However, the ghostly man can’t cross the threshold into a house, since the buildings have been consecrated to keep out demons and spirits. This forces the player to creatively influence people to open the doors for you, where you’ll soon be able to slip into any room without worry of solid walls. It’s wonderful to seamlessly transition from the bathroom to the kitchen without opening a single door, and really, I haven’t seen much like it before. The core gameplay involves putting together the various pieces of your murder and attempting to create a clear picture, and it will take a sharp mind to do so. When examining evidence, a handful of words will float around the screen that could be possible descriptors for the particular object. For example, if you pay attention to the dialogue and discover a bat on the scene of the crime, you can attach words like “metal” and “bent” to the tool and witness flashes of the murder as it occured. If you remember that you were tossed out the window on the top floor, the word “thrown” when interacting with the broken pane will key you in on just how it all happened. It looks to be a fun system to play around with, and while there are ghostly enemies roaming around the world that can be exterminated through a stealthy possession, the bulk of the action seems to be non-confrontational. I was only able to see a small slice of the actual game, though, so there’s likely plenty of mechanical twists buried within the final product. What I did witness was encouraging, and while it does barrow from L.A. Noire, Murdered: Souls Suspect still seems to be rich in both creativity and clever narrative touches. We should see plenty more from Square Enix before the game launches on Xbox 360, PS3 and PC in early 2014.